A representative of Far and Wild Safaris will collect you from the O R Tambo International Airport or from your overnight accommodation in Johannesburg. You will ravel through the Highveld industrial, mining and agricultural areas. Our guide will make this section interesting, adding value with his interpretation of the local history and sights. We make our way to the Nkomazi Private Game Reserve, arriving in time for lunch and your afternoon/evening game drive. The Komati Tented Lodge is an 'Out of Africa' 5 star tented accommodation and amenities. Each tent has an extra large king size bed, cooling and heating and an interesting indoor shower en suite. Along with an outdoor Victorian bath on the private teak sun deck, which also has a plunge pool. Pathways lead to the main tented area where meals can be enjoyed, whilst a treatment at the Relaxation Retreat will rejuvenate and relax, (Own account). Relax in comfort amongst the Nkomazi wildlife and varied biomes. Guests will be able to share in the many wonders of Nkomazi - its diversity of wildlife and habitat, its natural beauty and major geological features. Nkomazi is an extremely interesting ecological area, with features such as the oldest and largest meteorite impact deposit on earth. We would like you to experience, learn and enjoy the very best that our African wildlife safaris can offer. In order to achieve this, we have included the excellent game viewing at Nkomazi. Your local Ranger will provide insightful and valuable information about the fauna and flora of the reserve. Waterfalls and rock pools are impressive, while rolling grasslands support large herds of free-roaming wildlife, making Nkomazi a game-viewing haven. The Reserve represents a range of Africa's biomes with the ability to support game on the high-lying grasslands and the low-lying bushveld areas, extending the species diversity which includes high profile Big Game. One of the true joys of Nkomazi Game Reserve is the freedom to do nothing at all! In between game drives, your time can be filled with reading, relaxation treatments, sun-bathing and swimming or indulging in the wholesome Lodge cuisine. 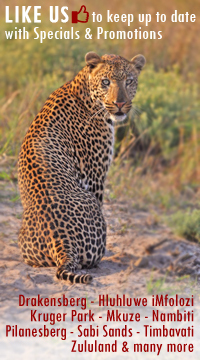 Game viewing is carried out during the morning and evening by experienced Rangers. Traversing through the Reserve, the wildlife is interesting in its diversity. The game drives take between 3 - 4 hours, with a coffee stop in the morning and a sundowners stop at a scenic vantage point overlooking one of the many vistas at sunset. This morning after our game drive and breakfast we depart the Komati Tented Lodge for the Itala Game Reserve. This reserve, tumbling from the heights of the Ngotshe Mountains a thousand meters down into a deep valley, carved over the eons by the Phongolo River revealing the world's oldest rock formations, is a game viewers paradise. This reserve is situated in the rugged, mountainous thornveld of northern KwaZulu-Natal and the reserve's multitude of habitats host a spectacular array of wildlife species. Its scenic beauty aside, Ithala's most characteristic feature is perhaps its astonishing geological diversity. Some of the oldest rock formations in the world are found here, dating back 3 000 million years. With a topographic profile varying from 400m above sea level in the north to 1 450m near Louwsberg in the south, Ithala's terrain extends over lowveld and densely vegetated riverine valleys to high-lying grassland plateaus, ridges and cliff faces. Ithala is a place of great seasonal contrast. With its many perennial streams and rivers, and the frequent occurrence of cliffs and rock faces, Ithala is also the ideal haven for a large variety of birds. Ithala's big game species include white and black rhino, elephant, buffalo and, notably giraffe, so numerous that they have been selected as Ithala's logo. The absence of lion makes for a relaxed air among these animals and other game such as zebra, blue wildebeest and a wide variety of antelope. These include impala, orbi, red hartebeest, eland, kudu, waterbuck, tsessebe, common and mountain reedbuck, steenbok and grey duiker. Predators which are not often seen are leopard, spotted and brown hyena. We leave the Itala Game Reserve travelling through rural Zululand and proceed to the Hluhluwe iMfolozi Park where we spend the night at Hilltop Camp. The accommodation here is in brick under thatch chalets, each of the bedrooms having its own private bathroom ( a bath with shower, a hand basin and toilet). Each chalet is also equipped with a fridge and there is a tea station. Your game drives commence on entering the gates into the Hluhluwe iMfolozi Park. This evening you go on a night drive in an open game-viewing vehicle with staff from KZN Wildlife, the organisation that is tasked with running this reserve. This is to improve on your chances of seeing some of the nocturnal species, such as leopard, lion, genet, hyena, bush babies and then the other nocturnal animals such as the owls and nightjars. Today will be spent on extended game drives to various areas of the Hluhluwe iMfolozi Park, with an early start to make the most of the day and to possibly chance upon a roadside kill or nocturnal predators on the road returning to their day-time lair. The Hluhluwe and uMfolozi game reserves are the oldest in Africa, this is where Zulu kings such as Dingiswayo and Shaka hunted, and initiated the first conservation procedures, where today the "big five" of Africa roam. Established in 1895, game viewing is the prime attraction. As the home of Operation Rhino in the 1950s and 60s, the Park became world renowned for its white rhino conservation. The Park covers some 96 000 ha and contains an immense diversity of fauna and flora. Hluhluwe is characterised by hilly topography, and this northern section of the park is noted for its wide variety of both bird and animal life. Sightings of rhino, giraffe, buffalo, wildebeest, zebra, warthog, baboon, vervet monkey, and antelope such as impala, nyala and kudu are seen frequently and with the possibility of seeing lion, leopard, cheetah, elephant, black rhino, hippo, crocodile, monitor lizard, hyena and antelope such as red duiker, steenbuck, waterbuck, bushbuck and then the rare Samango monkey and wild dog, much less frequently. These drives are conducted with your guide in his/her vehicle. This morning we depart the Hluhluwe uMfolozi Park after breakfast and make our way to the village of St. Lucia where we board a boat for a two hour cruise on the lake in this proclaimed World Heritage Site. Here you are guaranteed to see hippo, and a very good chance of seeing crocodiles as well as a vast array of bird-life. The iSimangaliso Wetland Park has both one of the largest estuary systems in Africa and the continent's southernmost coral reefs. In granting it World Heritage status in 1999, the World Heritage Committee noted the park's "exceptional biodiversity, including some 521 bird species". Situated on the central Zululand coast of KwaZulu-Natal, the park is made up of 13 adjoining protected areas with a total size of 234 566 hectares. Its remarkable biodiversity is a result of the park's location between subtropical and tropical Africa, as well as its coastal setting. The iSimangaliso Wetland Park has its origins in the St Lucia Game Reserve, declared in 1895 and made up of the large lake and its islands. St Lucia Park was proclaimed in 1939, containing land around the estuary and a strip of about one kilometre around most of the lake shore. After our two-hour cruise and lunch we make our way back to Durban, arriving late afternoon where we drop you off at your overnight accommodation or at the King Shaka International Airport in time for your flight.